The one that *didn't* get away. Dig deeper into Hanoi's food and markets. Escargot picante! Another round of dishes at Hanoi's Quan An Ngon restaurant. Dig deeper into Hanoi's food and markets. 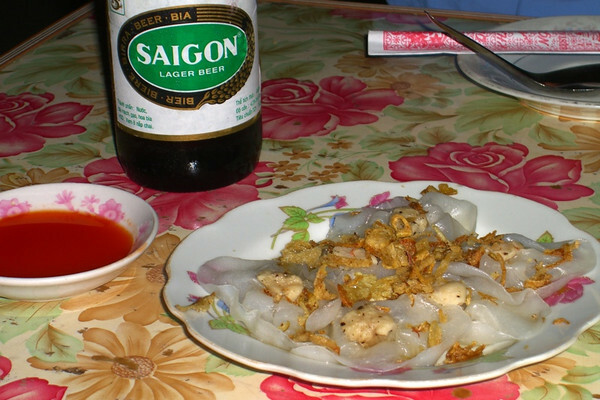 Looking for a safe place for an introduction to Vietnamese food? This is the place. The garden area is surrounded by kitchens in an open air street-stall style, so you can walk around and choose your meal based on what you see cooking or what you smell coming out of the stand. You can always ask questions. And as on the street, everything is fresh to order. Dig deeper into Hanoi's food and markets. 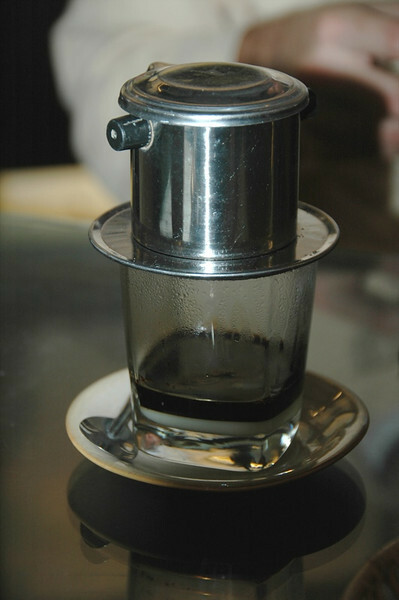 We were spoiled by cafe sua (coffee with sweet milk) in Vietnam, served as pictured here. The resulting coffee is strong, but not bitter. With the sweetened condensed milk, it had a dark chocolate, mocha flavor. Dessert! Dig deeper into Hanoi's food and markets. One of the dishes we ordered at Quan An Ngon was crab and shrimp paste barbecued and wrapped around sugar cane (Chao Tom). 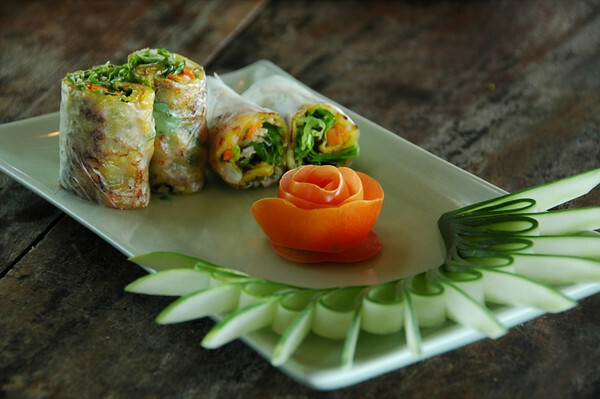 This version came with greens, noodles and dry, crispy rice paper to wrap the result like a spring roll. The waitress demonstrates the perfect technique with the rice paper to pile on the vermicelli noodles, crab and herbs. The result, divine. Dig deeper into Hanoi's food and markets. When you don't have a comprehensive grocery store sprinkler system, just poke a few holes in a plastic bottle, fill it partially with water and then squeeze for instantly refreshed fruits and vegetables. Dig deeper into Hanoi's food and markets. Whatever happened to that "golden yellow color"? Dig deeper into Hanoi's food and markets. Dig deeper into Hanoi's food and markets. The streets of Hanoi's old town are named in traditional commerce fashion. 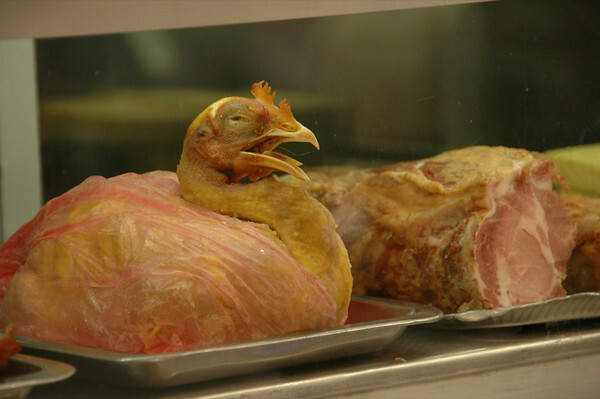 However, you can no longer find chickens for sale on Chicken Street. You can, however, find Cha Ca on Cha Ca street. 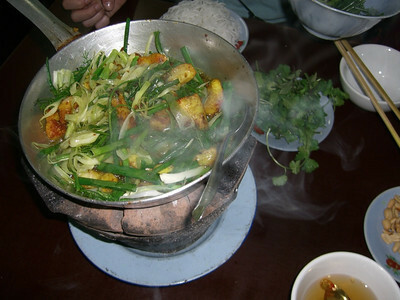 Cha Ca is a distinct hot pot meal of fish, turmeric, dill, coriander and other greens served with noodles, peanuts, vinegar and chilies. 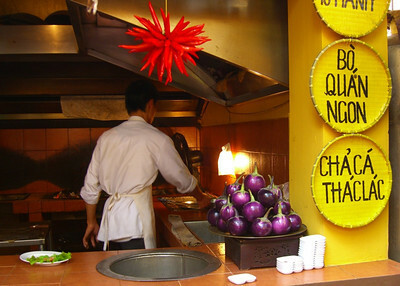 When you enter Cha Ca La Vong restaurant, a small card is placed on your table indicating that only one dish is served. After a short time, the main event shows up - sizzling fish in a yellow tumeric sauce. Pile in the greens and noodles, tasty bits, stir and enjoy the feast! 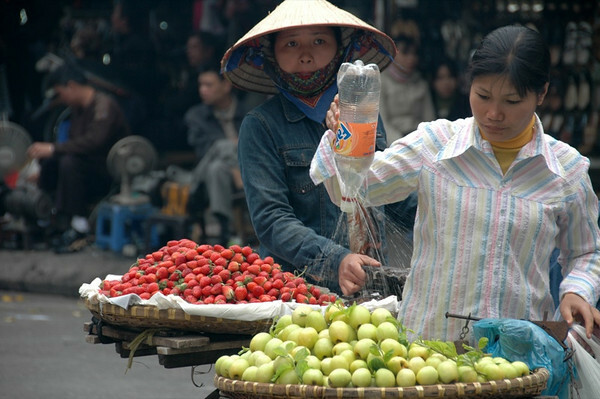 Dig deeper into Hanoi's food and markets. Like restaurants, vegetable and fruit markets are set up on the sidewalk outside of the Dong Xuan market. In Hanoi, sidewalks are intended for making business, not strolling. 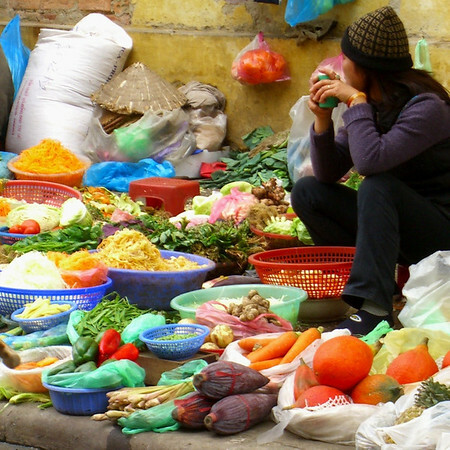 Dig deeper into Hanoi's food and markets. 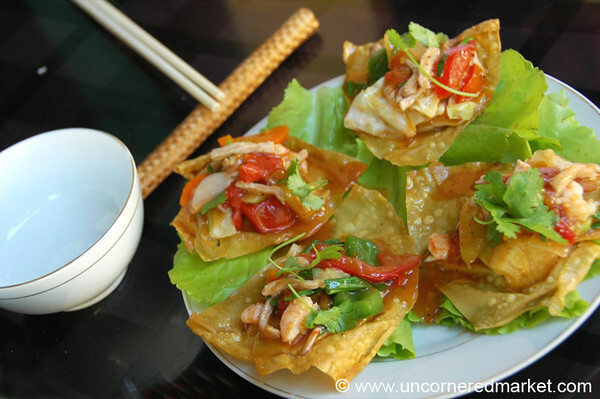 Hoi An is known for several specialty dishes, including White Rose shrimp dumplings. The recipe for these dumplings is secret, held by one family in Hoi An who supplies all the restaurants. We tried White Rose dumplings the first time at Cafe des Amis along the river. It was one of six dishes that came as a set seafood menu. We ordered one menu for the two of us, and left stuffed to the gills. 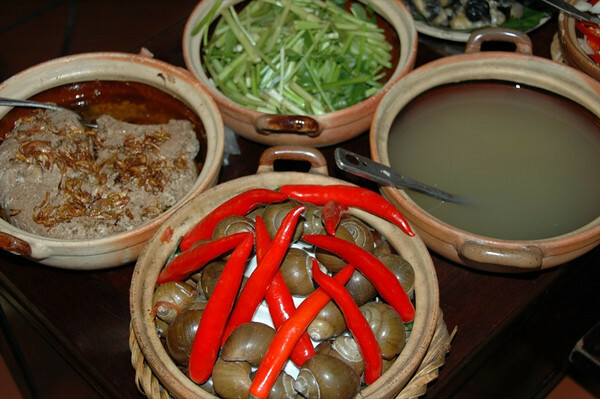 Read more about Hoi An food specialties. Pieces of squid cut for the effect of a flower. 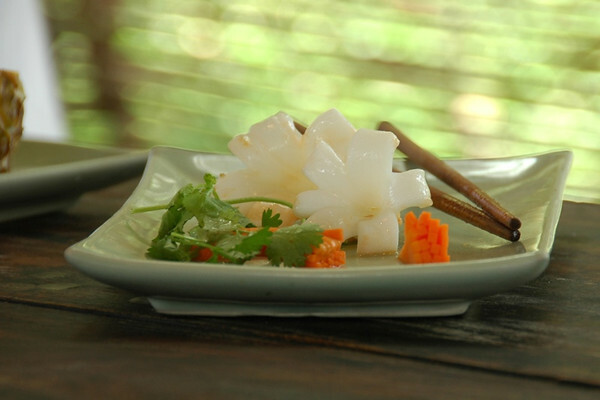 This was part of the preparation of warm squid salad in a pineapple. Scoring squid not only makes it look pretty, but allows it to expand while cooking in order to better absorb the flavor of the sauce it's cooked in. 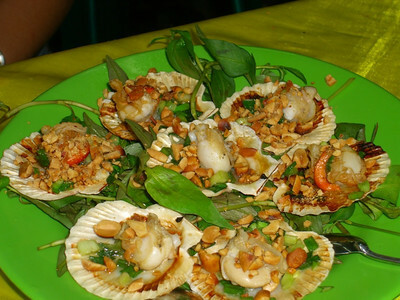 Read about Hoi An's food specialties. Bahn Xeo is a savory pancake with shrimp and pork sprinkled into its turmeric-touched batter. The pancake is filled with herbs and bean sprouts and should be rolled tight with rice paper. We tried this in several restaurants without the rice paper - what a mess! We also learned how to make tomato roses and cucumber fans. We don't expect to use that skill any time soon though. 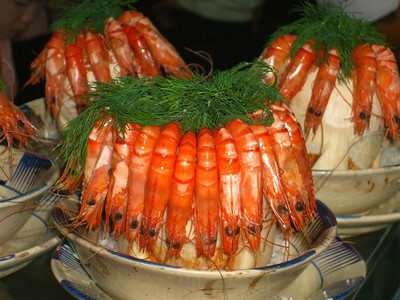 Read about Hoi An food specialties. 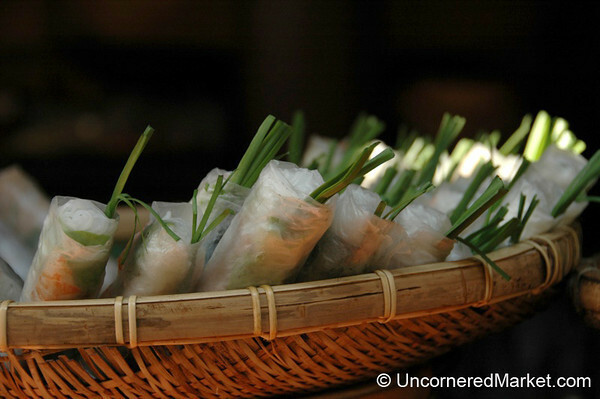 During our cooking course in Hoi An, we learned how to make fresh rice paper in order to roll our own spring rolls. Dan did quite well with his papers; Audrey needed a few more tries... 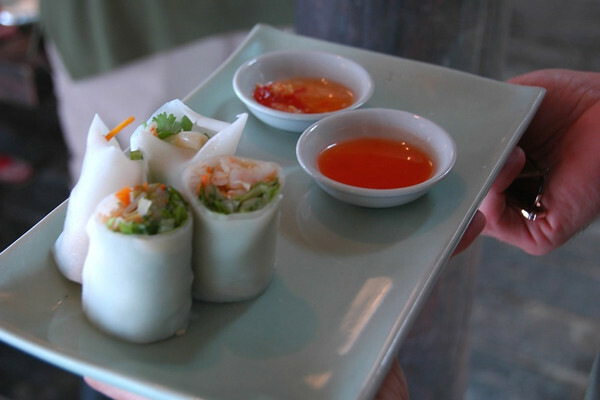 The result was the same for both, however - tasty and fresh spring rolls filled with shrimp, noodles and fresh herbs. 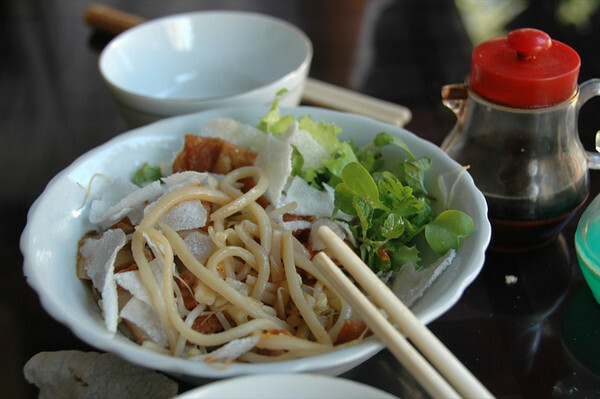 Read about Hoi An's food specialties. Beautiful shrimp stare out at us from a carved-out coconut. Seafood restaurants set up outside Ben Thanh market in the evening once the indoor market closes. This place also had live frogs hanging on a string. Each time a person would get close, all the legs would move about. It was a bit creepy, actually. 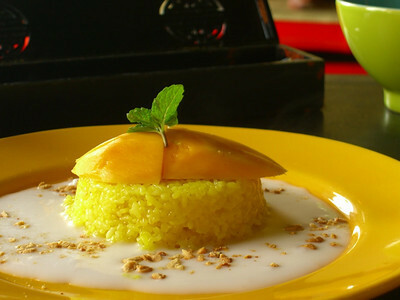 Welcome to Saigon food scene. 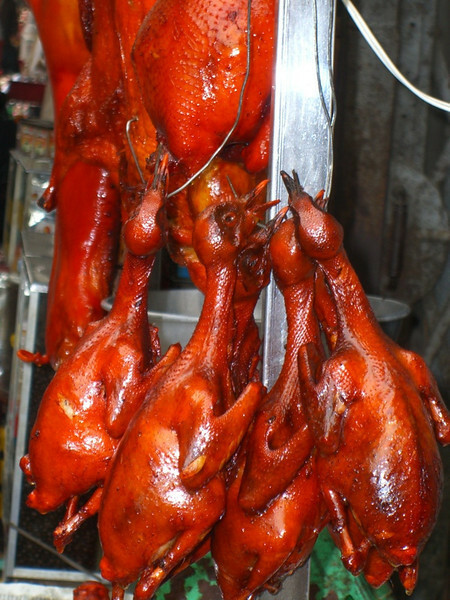 Read more about snackin' in Saigon. Audrey's favorite - sticky rice. And, four different types to choose from! The dark variety was the best of this bunch. 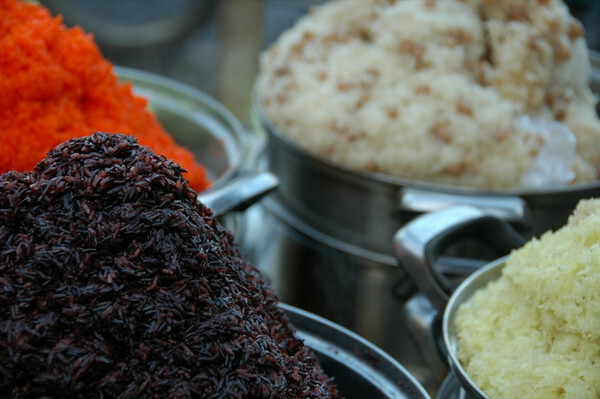 But it still can't hold a candle to the texture and nutty flavor of the purple and dark sticky rice in Laos. 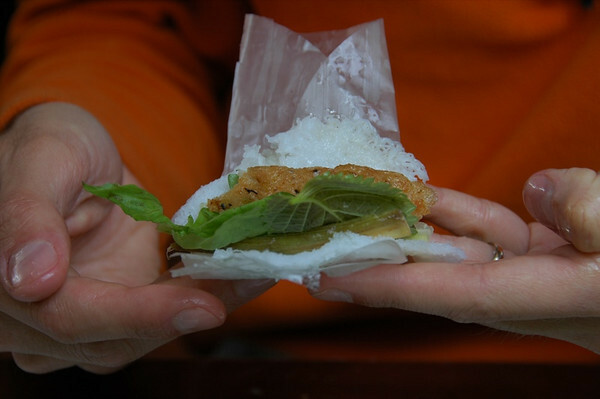 Read more about snackin' in Saigon.